I already posted this poem in this thread. But that was over a year ago, and even I have forgotten about it, I only noticed it now because it got an upvote. I noticed that after I posted it, and then upvoted you. Because of this post, I felt like I should share the poem the piece is arranged around. It's by William Blake. Last edited by Aquila89 on Tue Dec 15, 2015 12:12 am, edited 1 time in total. This text is just here because I can't seem to get a spoiler to show nothing but empty space before another spoiler tag, and also nested spoiler tags don't render properly. If you do see this text, pretend you don't, as the whole point is... well, keep reading. That's it. It's just a blank page. Sometimes the author reads it at his poetry readings (seriously; he says "This next poem is called 'Evasions,' " sits there for about five seconds without saying anything, and then reads the next poem). In the first post of this thread, I specified that "Fleas" "Lines on the Antiquity of Microbes" is *officially* the shortest poem ever published, because I've never seen "Evasions" mentioned anywhere else, even though it's infinitely shorter. Last edited by jbobsully11 on Mon Aug 29, 2016 3:47 am, edited 1 time in total. Last edited by ghijkmnop on Tue Mar 19, 2019 7:49 pm, edited 1 time in total. Richard Cory, by Edwin Arlington Robinson, is a poem I found a while ago, but forgot about until just now. Get out of my head Aquila! I was thinking of posting some more Hardy too. I've looked long and hard (that's what she said) for any Sassoon writings. Robert Burns wrote: Ha! whaur ye gaun, ye crowlin ferlie? 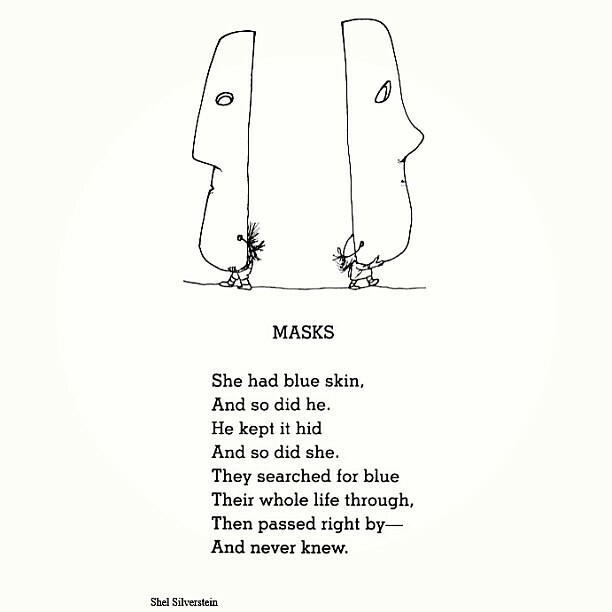 Here's a Shel Silverstein poem I just found called "Masks." Whose menstrual periods were stable. And another one that I read a while ago, but just remembered (not disgusting, though a bit of a groaner unless you like math/science puns). Last edited by jbobsully11 on Mon Jan 30, 2017 10:48 pm, edited 2 times in total. Two poems by Andreas Gryphius (recent events made me think of them). He was a 16th century German poet and he experienced the devastation of the Thirty Years War firsthand. Entire, more than entire have we been devastated! Fire, pestilence, and death my heart have dominated. From many has been forced even the spirit's treasure. as my land sank in angry, burning night. since all its terrors met me on one day. count up my fears, and I was very old. One of the year's most critically acclaimed albums, To Pimp a Butterfly by Kendrick Lamar, has interspersed in the tracks a poem that he wrote, dedicated to Tupac Shakur. He will start reading the poem, then stop at a certain point and a song will play that is connected in some way to the last thing said. Then after the song, the poem begins from the beginning again, getting a little farther, and so on in that manner almost per track until the end of the record, when he recites the entire thing, and then has a virtual conversation with Tupac by using old recordings of him. It's an interesting device and works particularly well at the very end, when he recites another poem a friend of his wrote describing Kendrick's life as it was now. Here are both.